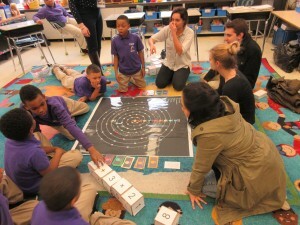 Space Race is a game that engages students with fundamental math concepts through kinesthetic learning. We tested Space Race during our last field visit with the students from School 2. By introducing dice, cards and a playing board, they immediately understood the game mechanics. These familiar tools afforded high learnability, providing just enough structure to make the game fun. By solving math equations, students are able to advance along the board, navigating the solar system to rescue a downed spacecraft. After rolling dice, the students would draw a card, which had a fact about the solar system, and a number they had to solve for. Rather than doing math with pen and paper, the students used boxes, with numbers and operators, that they would arrange in a way to solve for the given number on the card. The students found this very engaging. Once our little space pioneers arrived at the downed ship, they needed to fix it by shaking the Shakeweight. The Shakeweight was modified to count their shakes, and turn a light on once they reached a set number of shakes. The Shakeweight was an exciting reward for them. They wanted to see who could shake it the fastest, and it became a mini competition at the end. To account for disabilities, we made sure everyone had to be seated when using the Shakeweight, so it was fair.